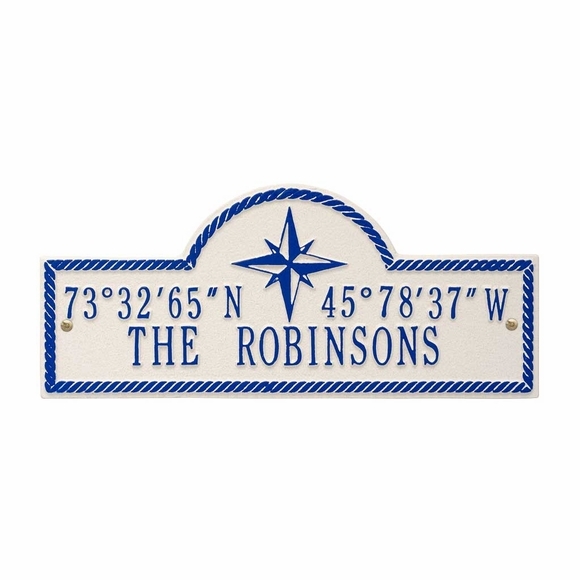 Personalized Coordinates Address Plaque - - displays the latitude and longitude of your address and the personalization you request. Made in USA. This unique custom plaque is personalized with the coordinates for your specified location. Please enter the Longitude and Latitude in the format shown in the sample (direction degrees minutes seconds). If you don't know the coordinates, please provide the complete address of your location (number, street, city, state, zip) in the designated input box. Line 2 contains your personalized text. This line holds up to sixteen 1.25" characters (including spaces). Each plaque is hand crafted in the USA from rust-free, recycled aluminum and finished in an all-weather paint. Available for wall or lawn mount. Lawn mount signs ship with two 12" stakes. Nautical rope border accents the elongated arch shape. Color: stucco with blue (shown in large image). Small image color is not current. Unique address plaque is personalized with the coordinates for your specified location.